In case anyone thought that it was a fluke when the Cleveland Cavaliers pushed around the defending champion L.A. Lakers on Christmas Day, on Thursday night the Cavs proved that not only can they manhandle the Lakers but they can do so shorthanded. The Cavs beat the Lakers 93-87 despite being without the services of 2009 All-Star guard Mo Williams and offseason acquisition Jamario Moon, two players who combined for 41 points on 14-20 field goal shooting versus the Lakers last time around. Without Williams’ three point sharpshooting and Moon’s opportunistic cuts to the hoop the Cavs did not score as much or shoot as well as they did on Christmas Day but they relied on the three pillars that have been their constant sources of strength under Coach Mike Brown: defense (the Lakers shot just .386 from the field, including .333 in the second half), rebounding (48-43 advantage, including a 40-27 landslide in the final three quarters) and the brilliance of LeBron James (37 points, nine assists, five rebounds, two steals, one blocked shot, 13-25 field goal shooting). James started slowly (six points on 2-5 shooting in the first quarter) and he connected on just one of his nine three point shots but he delivered 12 points on 5-7 shooting in the fourth quarter. James certainly authored an MVP level performance but this game should put to rest any questions about Cleveland’s depth or Cleveland’s supposed offensive deficiencies–the depleted Cavs beat a well rested Lakers team that owns the best record in the NBA and is at full strength. Shaquille O’Neal played the “Big Bill Cartwright” role to perfection with 13 points on 5-9 field goal shooting plus six rebounds and three assists in 28 minutes. O’Neal’s season highs this year (21 points, 11 rebounds) are below what he averaged during his prime but that just shows how misleading numbers can be without context: the Cavs won a league-best 66 games last year and would likely have at least come close to matching that total this season even without acquiring O’Neal–but O’Neal has provided an important physical presence in both wins over the Lakers plus a victory versus the Orlando Magic, two teams that had their way versus Cleveland last season. It is hard to imagine a less pleasant task for a low post defender than trying to keep O’Neal out of the paint while also dodging O’Neal’s sledgehammer elbows (although Cartwright was not nearly as physically imposing as O’Neal, his “educated elbows” connected with many players and made them think twice about entering the paint); young Lakers’ center Andrew Bynum–who is averaging 15.4 ppg and 8.5 rpg this season–was rendered ineffective by O’Neal in both games, managing just four points (on 2-5 shooting) and six rebounds in the first meeting and seven points (on 3-5 shooting) plus eight rebounds on Thursday. O’Neal has also had an obvious effect on Pau Gasol, who scored just 11 points on 4-10 shooting on Christmas Day and was even less efficient yesterday (13 points on 5-14 shooting). The Lakers jumped out to a 9-0 lead and had a 27-18 advantage at the end of the first quarter but that was just fool’s gold; Kobe Bryant scored 12 points on 5-8 field goal shooting in the opening stanza but that type of production and efficiency is not sustainable for 48 minutes against an outstanding defensive team, particularly when none of his teammates came to play with any energy, heart or toughness. Bryant finished with 31 points on 12-31 shooting, adding four assists and two rebounds. This was game one of an eight game road trip for the Lakers, which partially explains why Coach Phil Jackson sat Bryant out for the first half of the fourth quarter; the other reason, as Bryant himself mentioned after the game, is that Jackson wanted to see what kind of production the second unit could deliver. Although the Lakers’ bench hardly excelled, they did manage to keep the score close and Cleveland only led 83-80 when Bryant returned at the 5:23 mark of the final period. 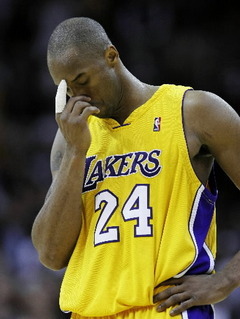 However, several of the Lakers’ next possessions came straight out of their playbook from 2006 and 2007, with Bryant being forced into what I call “hand grenade” shots after his teammates were unable or unwilling to create open shots: a “hand grenade” is when a player receives the ball with little time left on the shot clock (in other words, the ball is about to “explode” in his hands if he does not fire off a quick shot). First, Bryant had to launch a tough fadeaway after the Lakers exhausted almost all of the shot clock. After a James jumper put the Cavs up 85-80, Bryant was forced to chuck a “hand grenade” three pointer at the end of another futile Lakers’ possession. This is one example of why some of those statistics about “clutch play” are misleading, if not outright bogus; an individual player’s field goal percentage reflects not just his shooting ability or his “clutchness” but also the overall hierarchy on a team: when everything breaks down, the ball is going to find its way to Bryant, not to a lesser player. “Hand grenade” shots, desperation heaves from long distance with fractions of a second remaining on the game and/or shot clock and other similarly low percentage tries do not really tell us much about how “clutch” a particular player is or even how capable he is of creating a shot for himself in a “normal” situation. Eventually, the Lakers went back to an action that has been very effective for them the past two years: the Bryant-Gasol screen/roll play. Successfully running that play led to two Bryant free throws plus a Bryant jumper that tied the score at 87. A tough lefty layup by James put the Cavs up 89-87 but then the Lakers again ran the Bryant-Gasol screen/roll; this time, Bryant came off of the screen, froze O’Neal with a deft hesitation move and then blew by O’Neal into the paint. Several Cavs converged on Bryant, whose layup attempt rolled off of the rim, but Gasol had a free run to the hoop thanks to the attention drawn by Bryant. Gasol snared the rebound and Daniel Gibson fouled Gasol, who did not go up strong enough to finish the play against the 6-2 point guard. Gasol then compounded this shortcoming by missing both free throws. Since only 24 seconds remained, the Lakers were forced to foul. James split a pair of free throws–leaving the door open for the Lakers–but Ron Artest was called for a loose ball foul and Anderson Varejao drained two free throws to essentially seal the win. In addition to James’ great performance and O’Neal’s stout presence in the paint the Cavs also benefited from fine play by starting power forward J.J. Hickson, key reserve big man Varejao and Delonte West, who started in place of Williams (the Cavs announced before the game that a left shoulder injury will sideline Williams for four to six weeks). Hickson had 11 points on 4-6 field goal shooting plus a career-high 14 rebounds as he notched his first career double double, while Varejao not only made the clutch free throws but also contributed 11 points and eight rebounds. West’s boxscore numbers don’t look like much (three points, four rebounds, three assists) but there is a reason that he played a game-high 42:50–and it is the same reason that he led the Cavs in minutes played during last year’s playoffs: as Coach Brown said after the game, “Delonte’s stat line wasn’t pretty but I thought his toughness and the way he ran the team was terrific.” West is a gritty competitor whose value goes beyond what the numbers say and he had the primary defensive assignment versus Bryant down the stretch in the fourth quarter. Jackson did not mince any words in his postgame remarks, mentioning with a chuckle that the backboard blocked one of Gasol’s field goal attempts late in the game. Then Jackson made an even more pointed remark. After noting that Gasol is normally a “very good foul shooter” Jackson declared, “I’m sure that he was still thinking about the missed shot that he had on the play before and he didn’t get himself clear mentally.” Jackson likely could not be “sure” of such a thing so soon after the game unless this kind of weakness has either manifested itself on previous occasions or was very evident to Jackson based on Gasol’s demeanor/words. Perhaps even more disturbing for Laker fans than Jackson’s bold statement is that Gasol later admitted that Jackson was right: “I let a couple actions carry over in my mind and I wasn’t able to be effective in the last four minutes. When I went to the (free throw) line I was still thinking about a couple other times that I could have delivered or finished plays. I let that enter into my head and it obviously had a negative effect.” No one should jump to conclusions about two missed free throws or about a few quotes delivered within 30 minutes of those free throws being taken–Michael Jordan famously said that he failed thousands of times and that is why he succeeded–but this whole situation provides some insight into Gasol’s strengths and weaknesses as a player. Gasol is very cerebral–in his pregame remarks Jackson noted that he regularly gives Gasol lengthy, complex books that Gasol enjoys reading–and he possesses a wonderful basketball skill set but NFL Hall of Famer Steve Young likes to say that in football if you think too deeply you can end up all alone; similarly, one of the characteristics that Jordan, Bryant and James share is the ability to forget about previous failures/obstacles and then singlemindedly focus on the next play or the next shot. That is not to suggest that Jordan, Bryant and James are not cerebral–they all obviously possess high basketball IQs–but rather that they know when to turn off the critical parts of their minds in order to remain confident enough in their skills to make clutch plays. Gasol is cerebral enough to think about his failures and honest enough to admit to this in front of the media. Gasol should not be blasted for his intelligence or his candor but he also needs to develop a method to get out of his own way in such situations and rely on his skill set to carry him through instead of dwelling on what happened during previous plays. Someone mentioned that it seemed like Bryant would have a lot of words to say to his teammates as their long road trip proceeded but Bryant indicated that for now he did not plan to say anything because the most important thing is to get ready for Friday’s game versus New York, as opposed to dwelling on the loss to Cleveland. Anyway, Bryant added, he did not need to say anything because his teammates already “know that I’m (ticked) off.” Asked how he knew that his teammates realize how he feels, Bryant laughed and shook his head at the absurdity of the question. Both teams tried to deny that this game had any special meaning but I don’t think that anyone is naive enough to believe that. James was very animated throughout this game, often exhorting his teammates and the crowd to get them pumped up. After the game, James at first said “You don’t want to look to far into beating one team twice” before conceding “It’s a huge win and I can’t sit here and say it’s just a normal game because it’s not.” Think about the potential implications not only in terms of homecourt advantage for both teams in their respective conference playoffs but also the fact that if they finish with the same record and reach the Finals then the Cavs would own the tiebreaker for homecourt advantage in the championship series. It is obvious that Thursday’s game helps James in what rightly should be a two man race with Bryant for regular season MVP but it also sends a loud and clear message that–contrary to what many “experts” have been saying–the Cavaliers are very legitimate championship contenders with their current roster. The scariest sight for the rest of the NBA happened about two hours before tipoff: James came to the court to work on perhaps his only remaining weakness–outside shooting. James has been doing this for quite some time, as I have noted in previous posts (including my recap of Cleveland’s 2008-09 home opener), and his extra practice is clearly paying off: this season he is posting a career-high field goal percentage (.510) and a career-high free throw percentage (.781) while nearly establishing a career-high three point field goal percentage (.349). James does his shooting under the watchful eye of assistant coach Chris Jent but Jent is not very vocal during these pregame shooting sessions (Jent has mentioned in various interviews that James is quite responsive to his suggestions between games or during timeouts). James began this session with a barrage of jumpers launched from just inside the three point line on the right wing, making 18 of 38 by my count. James’ form has noticeably improved in several ways: he employs the shooter’s “gooseneck” followthrough now, he generally lands at or near his takeoff point, his balance is much better and his technique is usually the same from shot to shot (except when James occasionally goofs off and purposely shoots a high arcing or off balance shot). Considering how good his shot looks now I was actually surprised that he did not shoot a better percentage but perhaps he was just getting loose. James then shot a few shots from the top of the key just inside the three point line before making three out of nine top of the key three pointers. James audibly expressed disgust with several of his three point misses before slowing down, concentrating and starting to hit. James completed his perimeter routine with some shots from the left wing (long two pointers, then three pointers) and then he did something that I have yet to see him do in his pregame routine: he went to the left block, took one dribble to the middle and shot a jump hook. He repeated that action several times before trying a few one dribble, fadeaway jumpers to the baseline. James’ percentage on the jump hooks left much to be desired (well below 50%), which is probably why we have yet to see him unveil this shot very often in game situations, but when he gets more comfortable with that move he will add yet another weapon to his already formidable arsenal. James also practiced some postup moves from the right block, turning toward the middle to either shoot a short jumper in the paint or else a left handed finger roll. Twice during James’ routine he went to the free throw line; it is good to break a sweat and then try to knock down some free throws, as opposed to shooting them cold (which never occurs in a game unless a player is fouled on a very early possession). James shot 5-6 on his first set of free throws and then returned later to drain five in a row. After about 20 minutes his serious work was done and James then tried to make some halfcourt shots; I stopped keeping track after he missed his first 11, so when you see footage on TV of him making such shots keep in mind that he probably missed a bunch before finally connecting. One impressive thing that I noticed is that James can shoot from halfcourt–or at least very close to it–by using his regular form; that is a lot more impressive than his underhand or overhand flings from that distance. I remember Michael Jordan making a regular form, halfcourt shot in a game (I think that it was versus Seattle) but very few players have the necessary combination of strength and touch to pull off that feat. I respect James’ work ethic and I am impressed by his dedication; the only thing that I question is his shot selection, both in practice and in games: long two pointers just inside the three point line are the worst shot to take, so I don’t understand why James practices them so much or why he shoots them in games. Most coaches will tell you that they want their players to either take that step behind the three point line to get the extra point or else dribble in to get a closer shot, though some coaches prefer that their players simply catch and shoot in rhythm regardless of where they catch the ball. I realize that shot clock considerations and defensive alignments may force James to sometimes shoot long two pointers but I still think that he would be better off either shooting three pointers or 15-17 foot jumpers, because there is limited benefit to becoming a great 22-23 foot jump shooter when the 23 foot, nine inch shot is worth a full point more. Prior to the game I spoke briefly with Mychal Thompson, a 20-10 player for Portland (20.8 ppg, 11.7 rpg in 1981-82) who became a key reserve on Laker championship teams in 1987 and 1988. Thompson is currently a Laker broadcaster. I greeted Thompson by reminding him of a line from David Halberstam’s classic “The Breaks of the Game”; Halberstam noted that Thompson is a “Mychal of greater distinction” thanks to the unique spelling of his first name. Thompson smiled and said that he vividly remembers Halberstam traveling with the Blazers while researching the book. Thompson added that “Breaks” still “reverberates” decades after it was originally published. Thompson’s old coach Dr. Jack Ramsay was at the game and Thompson told me that he and Ramsay had just had a conversation lamenting what could have been if the Blazers had drafted Michael Jordan instead of the star-crossed Sam Bowie. Ron Artest played solid defense and had a good floor game (seven rebounds, four assists) versus Cleveland but he scored just eight points on 3-10 shooting, including 2-8 from three point range; he is averaging a career-low 11.6 ppg on .420 field goal shooting, slightly below his career .422 norm, though he is shooting .384 from three point range, the third best mark of his career and well above his .345 career average. Bryant became the youngest player in NBA/ABA history to score 25,000 points and just the 19th player to reach that milestone (the wire reports that you may have seen that rank Bryant 15th on the all-time scoring list are neglecting to include the ABA point totals registered by Julius Erving, Moses Malone, Dan Issel and Rick Barry). Bryant’s record is likely merely a placeholder for James, who already has over 14,000 points and will likely corner the market on “youngest ever” records before he retires, but what I find fascinating is that Bryant’s impressive career total is still a good career behind Kareem Abdul-Jabbar’s all-time record of 38,387 points: Hall of Famers Dave Cowens and David Thompson each scored fewer career points than the difference between Abdul-Jabbar and Bryant’s career totals! Bryant will have to remain a 25-plus ppg scorer well into his late 30s in order to have a shot at the all-time mark (unless Bryant decides to extend his career past the point when he is no longer an All-Star caliber player, something that does not seem likely considering his temperament). Interestingly, not one postgame question referred to Bryant scoring his 25,000th point, perhaps because the writers already knew that Bryant would not want to focus on an individual goal after his team had lost. During Bryant’s postgame standup I had my first couple close up glimpses of his right index finger, which I had previously only seen on TV and bandaged up. It was bad enough when Bryant suffered an avulsion fracture to his pinkie on that same hand a while back but it is amazing that he is playing with that kind of injury to such an important finger on his shooting hand. Bryant kept his hand out of view most of the time but I saw enough to notice that there is significant swelling from the base knuckle nearly up to the tip, with the most pronounced swelling around the middle knuckle, where there is noticeable discoloration. I doubt that Bryant can bend any joint on that finger (TNT’s Kenny Smith noted earlier in the week that Bryant’s finger is so damaged he could not even use to try to tie the drawstring on his shorts).